River Run Golf Club for each reservation. About 36278 Sunflower Boulevard, Bayside: This Platinum-rated, 3-bedroom + den, 3-bath Bayside town home features a gas fireplace, well-equipped kitchen, central air conditioning, washer, dryer and more. Private garage, too. Non-smoking. No pets allowed. Notes: Limited to 2 free passes per reservation. Offer subject to change without notice. Community Amenities & Features: See the latest Bayside information. This waterfront golf resort community offers a quiet escape just minutes from the beach, with fantastic amenities, too — including its 18-hole Jack Nicklaus Signature Golf Course. Bayside features even more to challenge the mind, body and spirit, including a classic carousel park, performing arts stage (with performances throughout the summer), shoreline nature trail and community pier. Plus, the Sun Ridge Tennis & Recreation Center has an outdoor pool, tennis courts, exercise facilities, 20-person hot tub, Kids' Splash Zone, basketball court, volleyball courts, and picnic and playground area. A beach shuttle is available during the summer season. 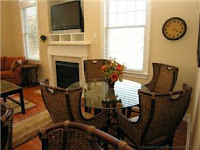 Book this Bayside resort vacation rental today.